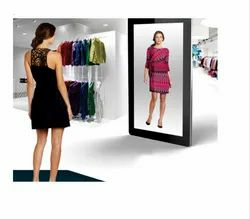 Virtual Mirror is an Augmented Reality based dressing room for Brick & Mortar and online platform giving your customers a visual connection with your products before purchase, thereby enriching their shopping experience. · Completely finished factory made units and highly flexible to suit different room dimensions. · The walls are made of high grade concrete and all standard fixtures can be anchored on the walls. We are the best supplier of Portable Dressing Room. In order to cater the assorted demands of our prestigious patrons, we are highly immersed in offering services for Portable Dressing Room. Widely appreciated for delivering these services at par with the necessities of our customers, these portable dressing rooms are accessible with us in different sizes and dimensions.